New life-sized weapon from DarkAntz. 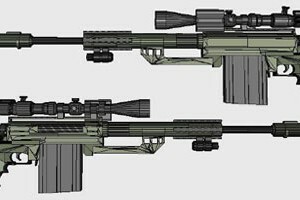 He made awesome jungle camo M200 Intervention sniper rifle. For a COD MW2 lover, this rifle is very familiar. The patterns come with a single file about 5 megs or you can download them part by part. There are some tips from him for building this model, the butstock requires 2 stiff tubes for the telescoping sholder stock. Standard rolled tubes with cardstock is to flimsy for this, so we will need to roll stiff tubes. Roll 1 sheet of standard print paper and use marker to paint black. Please see the first video to see how to make it. New papercraft patterns from DarkAntzMK-II, he create a life-sized model of Heckler & Koch UMP 45 submachine gun papercraft. He also made for us patterns of wall mount for this SMG. The UMP (Universale Maschinenpistole, German for "Universal Machine Pistol") is a submachine gun developed and manufactured by Heckler & Koch. 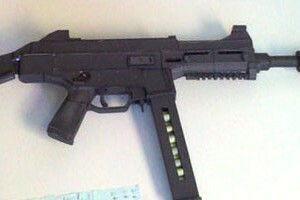 The UMP has been adopted by various agencies such as the U.S. Customs and Border Protection. Heckler & Koch developed the UMP as a successor to the MP5, though both remain in production. 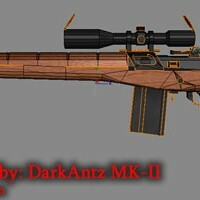 New papercraft / papermodel from DarkAntzMK-II. Now he made a life-size model of AA-12 Automatic Shotgun. 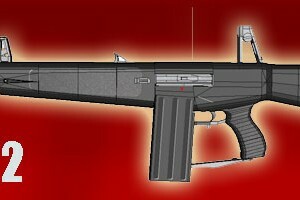 The AA12 originally designed and known as the Atchisson Assault Shotgun, also called Auto Assault 12. Its standard magazine can hold 8 rounds and 20 or 32 rounds in drum magazines. This model is in pdo file which needs pepakura viewer to open and print. This is my third life-size papercraft and the second real weapon model that I've design. 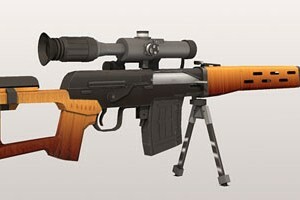 I choose Dragunov sniper rifle first because of its raretity and the classic touch of the original design. This Dragunov is an early version Russia made of SVD (Snayperskaya Vintovka Dragunova) or Dragunov Sniper Rifle in English. I still use modular parts like my previous 1:1 scale model in this papercraft design.